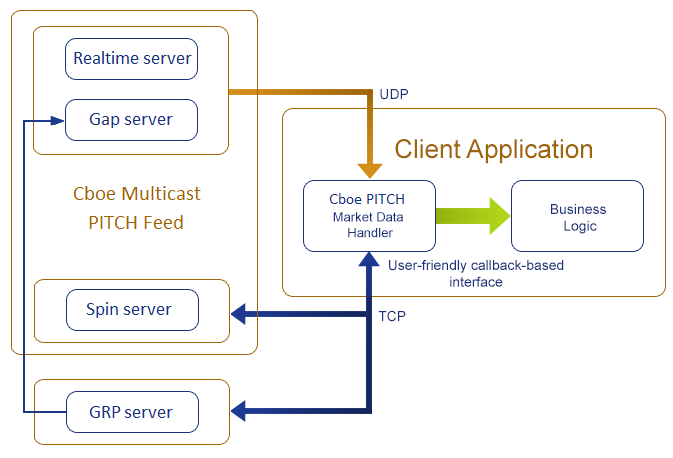 Cboe Futures Exchange (CFE) Multicast Depth of Book (PITCH) market data protocol API is same as the Multicast PITCH protocol used by the Bats US Equities and Options exchanges, with the addition of CFE specific messages. CFE market participants use the CFE Multicast PITCH API to receive real-time depth of book quotations and execution information direct from CFE. The Multicast PITCH protocol is more timely than the Multicast TOP protocol. The Cboe CFE Multicast PITCH market data protocol API supports the Spin Server that enables participants to connect via TCP and get the current CFE book quickly in the middle of the trading session without worry of gap request limits supported by the Gap Request Proxy (GRP). The OnixS directConnect: Cboe CFE Multicast PITCH Market Data Handler is a software component (library) that provides ultra-low latency access to the Cboe CFE Multicast PITCH Data via multicast UDP interfaces. High-level and easy-to-use API that enable quick integration of Cboe CFE PITCH Data without deep involvement in the specific protocols. Order book recovery via Spin Server and Gap Request Proxy (GRP). Getting Started, Benchmark and Backtesting samples designed to get up and running rapidly.